Looking for a unique and exciting destination for your next corporate outing? Plan an event at BSC! 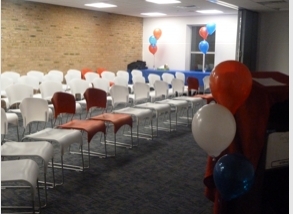 Branchburg Sports Complex is the perfect venue to allow colleagues to interact and bond in an informal atmosphere. The environment is professional, high energy and most of all- fun! Our events will help build deeper relationships within the workplace, increase camaraderie and boost employee morale. BSC can provide private meeting facilities that offer flexible table arrangements and a 52” HD television with multi-media hookups. We can combine your meeting with team building activities and games that focus on your specific goals. Our special team building “Quest for Success” Laser Tag is a corporate favorite that can be enjoyed by employees of all ages. In addition, we offer arcade games, field sports and a variety of catering options to create a truly custom event. BSC has an extensive team building curriculum from which activities are chosen to meet the needs of your team. We select specific exercises that will bring your group together for a stress-free and relaxed bonding experience. Does your group have a unique need? 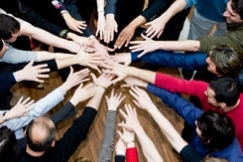 BSC’s team building staff will work with you to create an event that is right for your group. 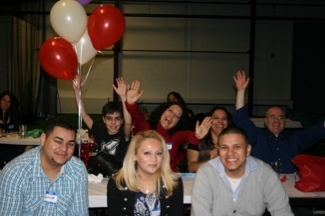 We can accommodate groups of all sizes and develop events that fit your time frame. Contact us at 908-203-1640 or events@branchburgsports.com to discuss your goals. We look forward to creating the perfect event for your group!